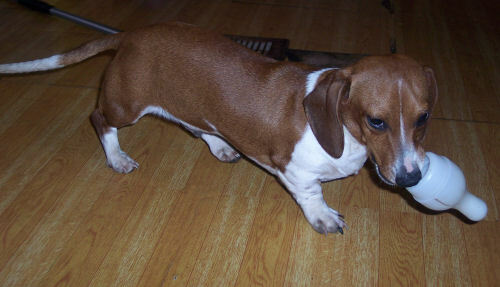 Low and long, the Dachshund is powerfully muscled and has a characteristic shape that rarely passes unnoticed. 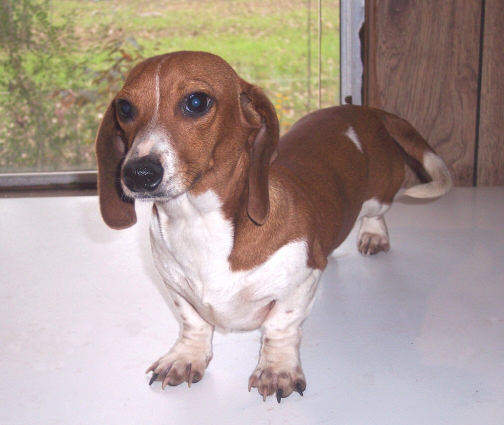 In the US, the Dachshund comes in two sizes: standard and miniature. For each size, there are three coat varieties: Smooth the most popular in the US, the coat is short, smooth, and shining. Longhair sleek, glistening, often slightly wavy this coat gives the dog an elegant appearance. Wirehair with the exception of jaw, eyebrows, and ears, the entire body is covered with a uniform tight, short, thick, rough, hard outer coat but with finer, somewhat softer, shorter hairs (undercoat) everywhere distributed between the coarser hairs. Except for their beards and bushy eyebrows, the wirehaired Dachshund, when viewed from a distance, resembles the smooth. 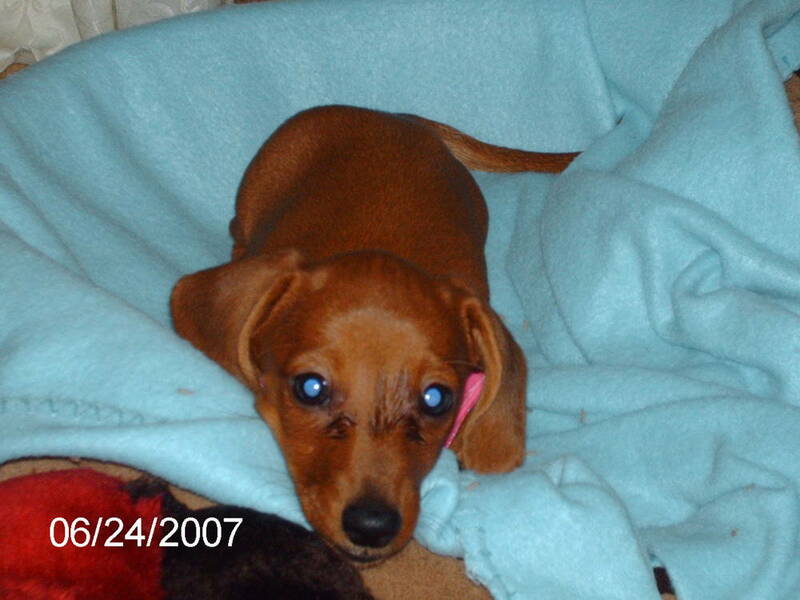 All six Dachshund varieties are similar in body-shape and coloration. The pattern and color range is great and includes solids, two-colored, dappled, and brindle; colors vary and include red, black, cream, chocolate, wild boar, gray, and fawn. The head tapers evenly to the nose, which is always black. The eyes are rimmed in black, medium sized and almond shaped, with a dignified and knowing expression. Adding to this thoughtful look is a pronounced bridge over the dog's eyes. 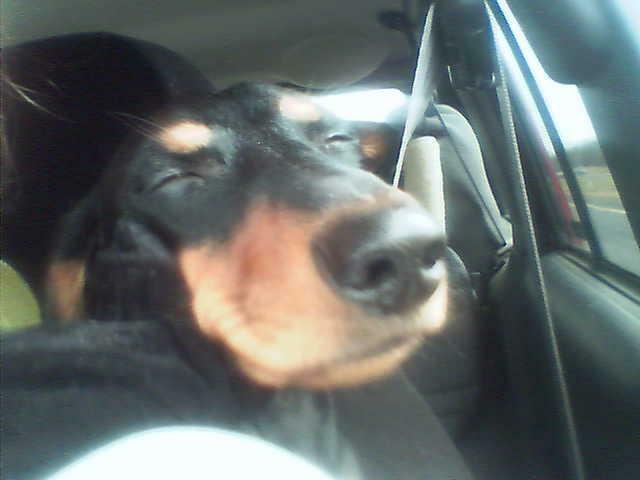 The dog's medium length, rounded ears are set near the top of the head. The dog has a strong breastbone and a tucked-in abdomen. 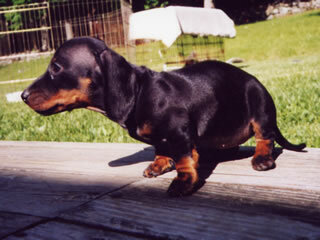 Dachshunds move with a fluid and smooth gait. 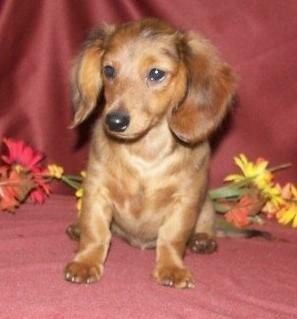 Height (Male) Std: 8 - 9", Min: 5 - 6"
Height(Female) Std: 8 - 9", Min: 5 - 6"
Common Misspellings Datsun, Dachund, Dashund, Dawtson, or Dotson. All of their senses are well developed. Ever ready for fun and mischief, the Dachshund is known to turn training sessions into a game, and often makes his owner feel as if the balance of power may have shifted without his knowning. They can be willful and clownish, but also uncommonly devoted to their family and moderately protective. 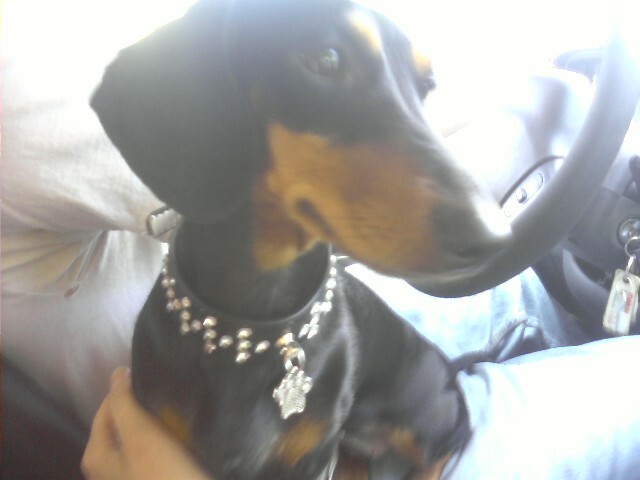 Dachshunds are good travelers. 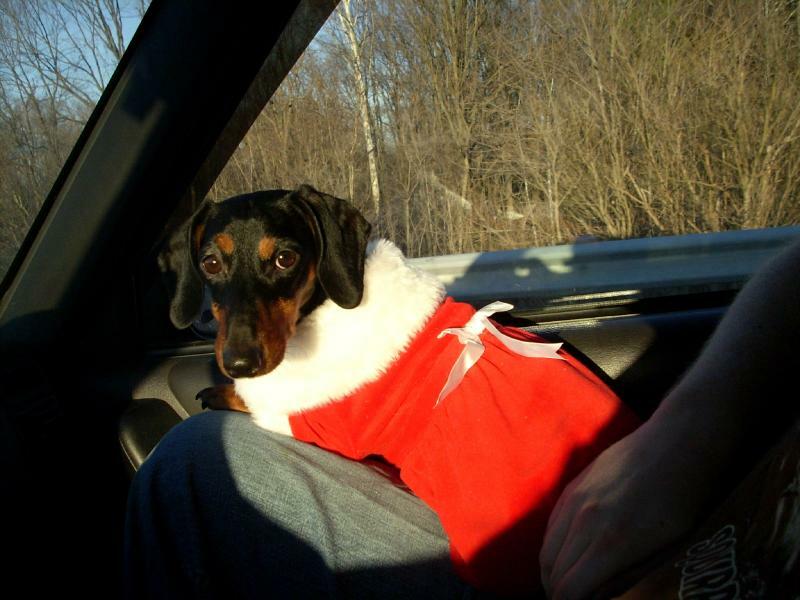 Generally, they tolerate other pets; however, if a Dachshund becomes jealous of another pet or is just plain cranky, it can become intractable and aggressive, occasionally to the point of biting. Sometimes they will refuse to be handled. 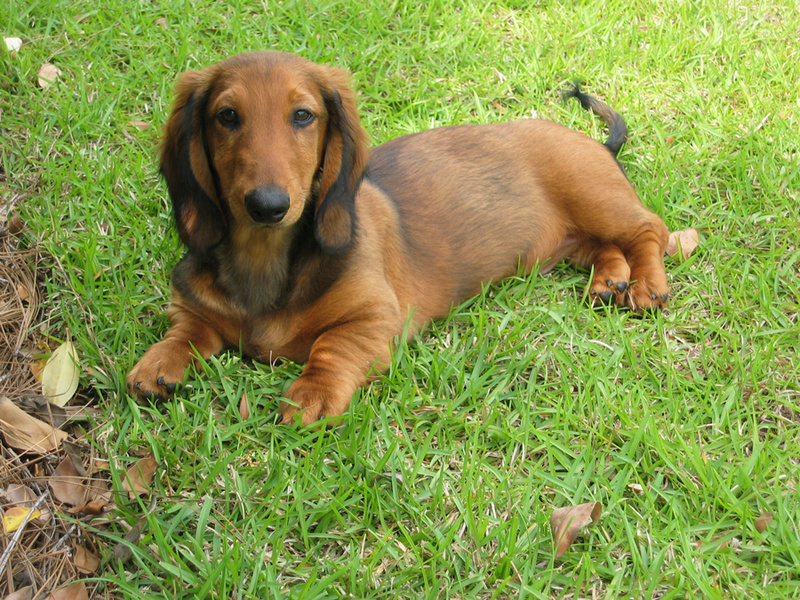 Dachshunds enjoy barking and have a bark that is surprisingly loud for their size. They are compulsive diggers. Do not allow your Dachshund to jump, run down lofty stairs, or be handled by small children without supervision (as much for the dog's sake as the child's); the dog's back and spine are sensitive and easily damaged. 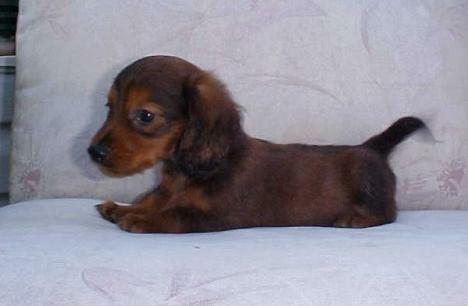 The Dachshund's weight must also be monitored to avoid additional strain on its long back. Dachshunds are not fragile dogs (after all, they were bred for hunting) but a little precaution helps. When holding a Dachshund keep its back horizontal, somewhat like holding a football with the rear quarters tucked under your arm and your hands supporting the chest. Grooming differs with coat type: Longhaired need very regular brushing; Wirehaired need professional trimming every six months or so; and the Smooth requires little more than an occasional rubdown. Dachshunds are average shedders. 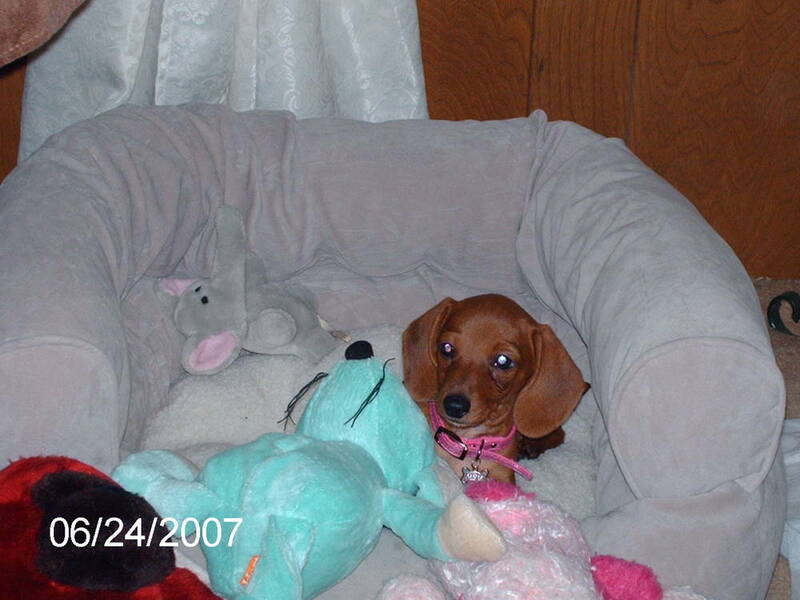 Housebreaking can be difficult with Dachshunds. 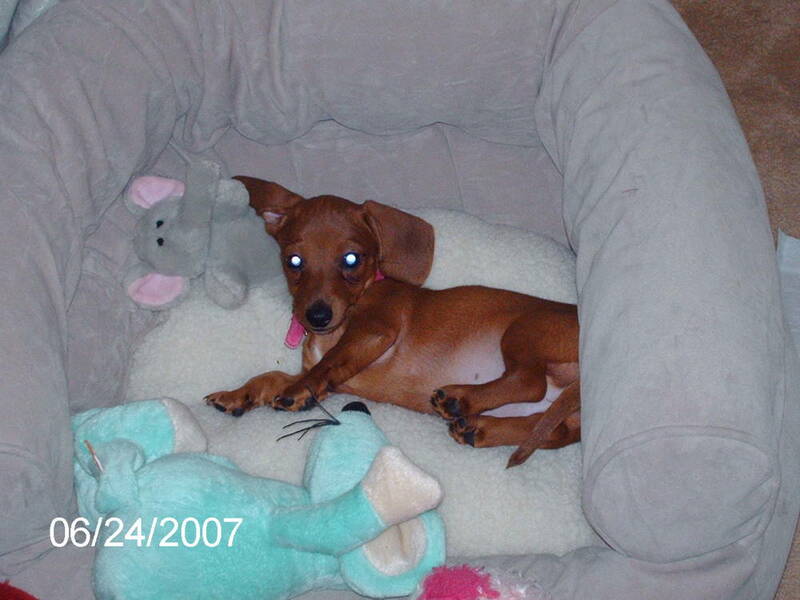 Dachshunds are very intelligent dogs, and learn fast, but mostly when it suits their purposes. This is where their stubbornness shows itself most clearly, making some dogs a bit of a challenge to train. Consistency and patience go a long way. Health concerns for this breed include intervertebral disk disease, KCS (Keratocunjunctivitis sicca), diabetes, gastric torsion, patellar luxation and seizures. 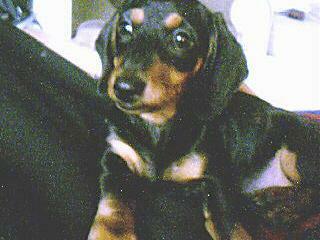 In fact, the word Dachshund is German for Badger Dog. These dogs were renowned for combining hound-like tracking abilities with a terrier's compact size and tenacious spirit, both much needed in pursuing badgers.During the 1600s, the word Dachshund began to be used to describe these dogs, though only animals with longhaired or smooth coats were classified as such; Wirehaired Dachshunds would not be recognized until the late 19th century. 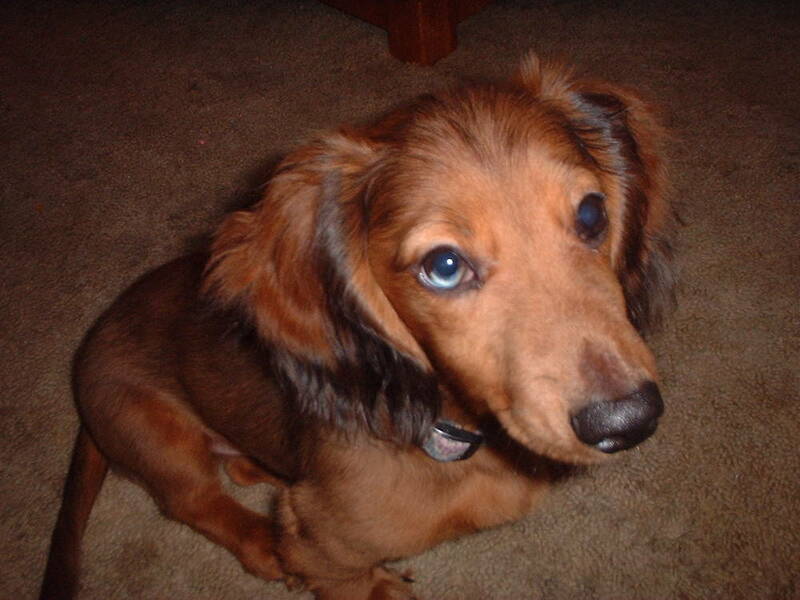 As the Dachshund became recognizable, breeding between the different coat types was banned in Germany. Two different sizes emerged as the breed developed, and each size was specialized by game: dogs over 25 pounds hunted badgers and occasionally boars, while the smaller Dachshunds' forte was rabbits and foxes.Importations into America date back in the American Kennel Clubs Stud Book to 1885, the same year that the Dachshund was recognized by the AKC. 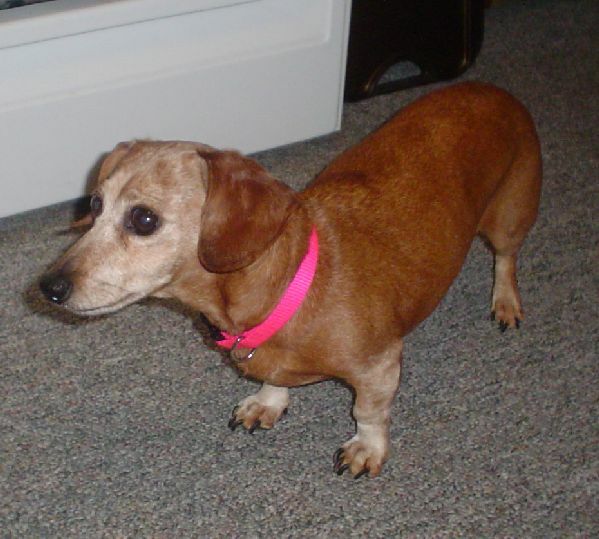 Through a misunderstanding the Dachshund was wrongly classified: the German hund was translated as hound and so the small, short-legged dogs were grouped with the hounds. 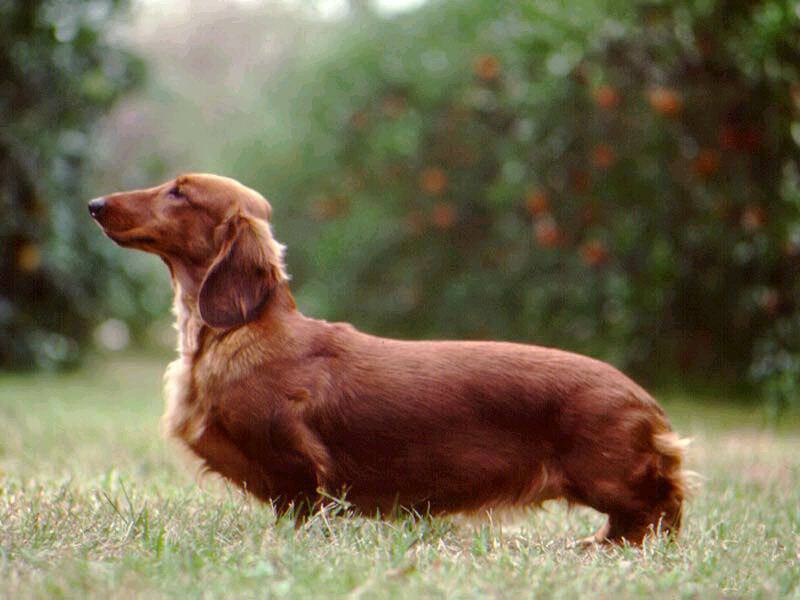 By 1914, Dachshunds were among the ten most popular entries in the Westminster Kennel Club Show. 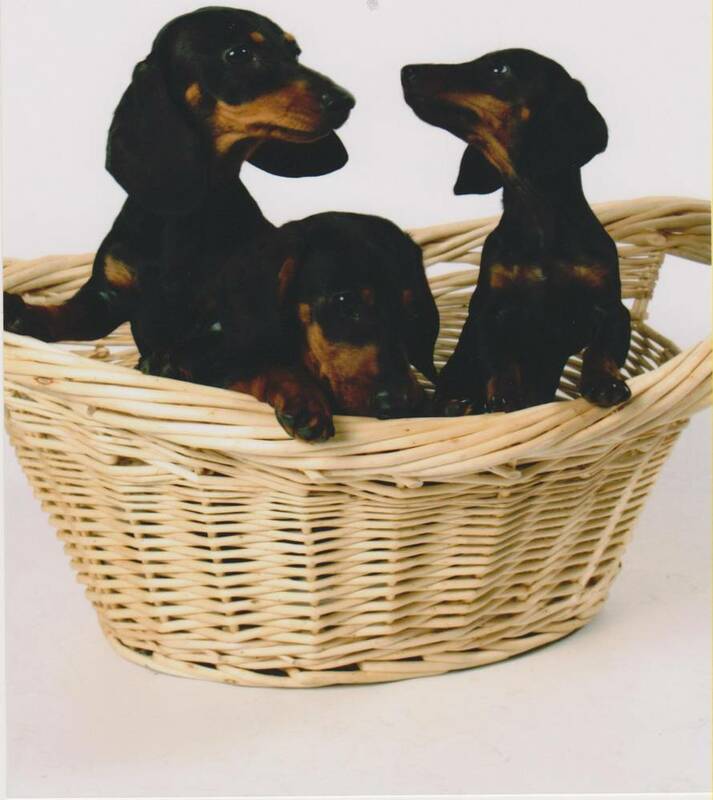 Today, the Dachshunds unique appearance and uncommon devotion has made it one of the most popular breeds in America.